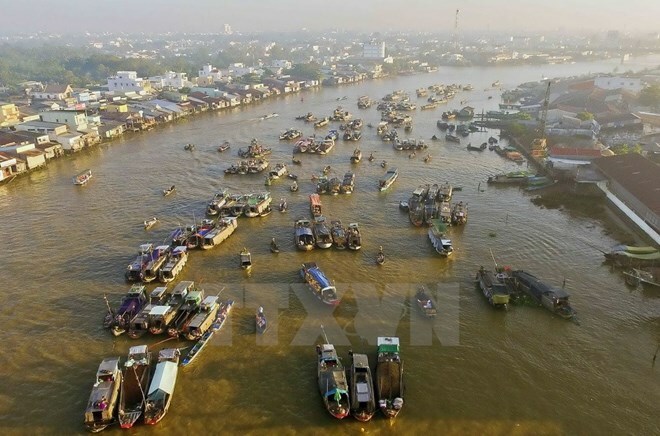 Hanoi (VNA) – This year, the Mekong Delta region will focus on enhancing tourism promotion and connectivity in the north, central and Central Highlands regions, as well as foreign markets in Southeast and East Asia. Tran Viet Cuong, Chairman of the Mekong Delta Tourism Association, made the statement at a tourism promotion conference for the region held in Hanoi on March 27. As part of the Vietnam International Travel Mart (VITM) 2019, which began the same day, the conference aimed to introduce the region’ natural resources, tourism products and activities. It also called for partnerships in human resources training and investment in tourism development. Spanning 40,548 km2, the Mekong Delta comprises of Can Tho city and the provinces of An Giang, Bac Lieu, Ben Tre, Ca Mau, Dong Thap, Hau Giang, Kien Giang, Long An, Soc Trang, Tien Giang, Tra Vinh and Vinh Long. The region is renowned for eco, spiritual, cultural-historical, community-based agricultural and sea-island tourism, with highlights including tours to Cai Rang floating market, Temple of Ba Chua Xu Nui Sam, and Ca Mau Cape, don ca tai tu music and Ngo boat racing. The 13 localities are working to develop meetings, incentives, conferences and exhibitions (MICE) tourism.